The return of Egypt's domestic league has been put back another month, and is now set to restart on 17 October. Football in Egypt has been disrupted since a deadly riot in Port Said on 1 February cost the lives of more than 70 people. Players and supporters from leading club side Al Ahly were attacked by the fans of rival club Al Masry, at the end of a league match. Plans to restart the league on 17 September had angered Ahly followers. They felt it wrong to resume playing whilst the trial of those accused of being involved in the Port Said tragedy was ongoing. Some Ahly fans are also calling for the Egyptian FA to be disbanded and for their club's board of directors to step down. Saturday's decision to postpone the resumption of the league comes amid rising tension and follows violent protests from a section of Ahly fans. 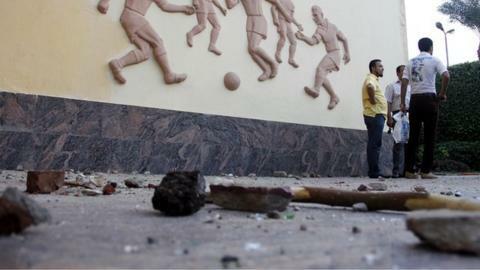 Supporters invaded Ahly's training ground on Wednesday, before attacking the headquarters of the Egypt FA. Following the protest - led by Ahly Ultras - the Minister of Sports, Al Amry Farouk, said the planned restart of the league would not be affected. The Egyptian Super Cup went ahead on Sunday as scheduled between Ahly and ENPPI in Alexandria. This after the Ahly Ultras withdrew their threat to try and storm the stadium in order to get the match cancelled. An Ultras fan told BBC Sport: "We got information that police told locals that we're thugs going for chaos and everyone in that area is armed. "We value our boys' lives so - to save souls - we called off the protest." The BBC understands that a small group of fans did still march to the stadium, including Ahly supporters based in Alexandria. The handful of matches which have taken place in Egypt since February have been played behind closed doors.